With the assistance of an experienced team and latest technology machines, we bring forth highly durable Stainless Steel Chequered Sheets & Plates. 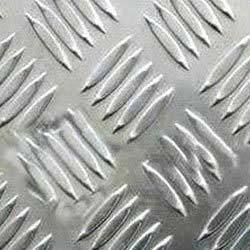 To cater to the assorted needs of the industries, we provide the Stainless Steel Chequered Sheets & Plates in diverse types. Manufactured from the premium raw materials, our Stainless Steel Chequered Sheets & Plates are highly efficient. Strict quality-tests ensure that only defect-free Stainless Steel Chequered Sheets & Plates reach the buyers. Few words that better describe our Chequered Sheets & Plates are durable and corrosion resistant. We are capable of delivering bulk orders of the Chequered Sheets & Plates within the promised time frame. Grade : 304, 304L, 304H, 309S, 309H, 310S, 310H, 316, 316H, 316L, 316 TI, 317, 317L, 321, 321H, 347, 347 H, 409, 410, 410S, 430.